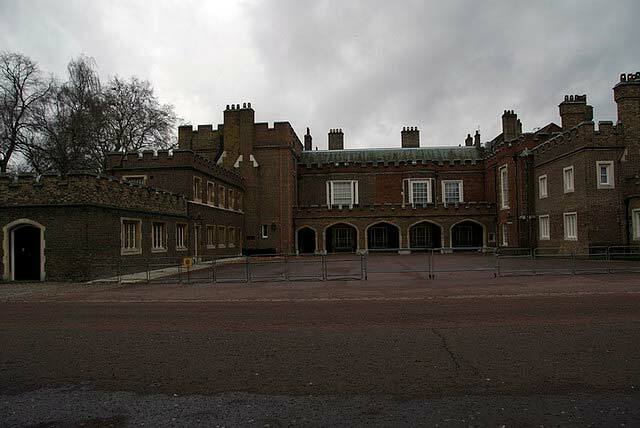 St. James’s Palace’s beginnings were not all that auspicious. Henry VIII built it on land that had once held a hospital for women lepers dedicated to St. James the Less. The palace, which originally had four courts, was not used often by subsequent rulers. Still, this Tudor building was where Queen Elizabeth II was proclaimed Queen and gave her first speech as Queen. The palace, even with its long history of fires and extensive renovations, is still the Queen’s official residence and is located in Pall Mall, on the north side of St. James’s Park. Though St. James’s Palace has no visiting hours, there is a changing of the guard ceremony in Frairy Court opposite the Queen’s Chapel. The chapel was built in 1622 to please Henrietta Maria, the Catholic wife of Charles I. It was the first church in England that was built along Italian lines. Additionally, it was built during a time when the building of Catholic churches was forbidden in Protestant Britain. Henrietta Maria’s chapel was designed by the great architect Inigo Jones, who also designed the Queen’s House at Greenwich and the Banqueting House at Whitehall. This beautiful chapel has a vaulted, coffered ceiling that was based on a reproduction of an ancient Roman temple. Tourists might also get a glimpse of the Chapel Royal at certain times. The facade that most people are familiar with when they think of St. James’s Palace is the Gatehouse with its red brick, octagonal towers and clock. This gatehouse hides a complex of buildings that are used as residences by several members of the royal family and important royal courtiers. The palace has an interesting and fraught history. During the period of the English Commonwealth, Oliver Cromwell, the Lord Protector of the Commonwealth, took the palace over and converted it into barracks. After Cromwell, the palace was renovated by Charles II and became the sovereign’s principal residence during the joint reign of William and Mary. Kings George I, II and III lived at St. James’s when they were in London, but a fire ravaged the palace in 1809, and destroyed the monarch’s rooms. They were never replaced, though the State rooms were. George III and his Queen went to live in Buckingham House.